This morning, longtime news anchor and host of the Today show Matt Lauer was fired from NBC for allegedly engaging in multiple instances of sexual harassment. Amid the controversy, however, many have some serious doubts about an upcoming, high-profile project he was recently associated with, which now begs the question: Is Harvey Weinstein’s Matt Lauer biopic starring Louis CK in trouble? Let’s just say… this isn’t looking good. According to those close to the matter, Lauer’s harassment allegations are presenting some serious hurdles for the film, titled American Newsman: The Matt Lauer Story, which was co-directed by Brett Ratner and Roman Polanski and written by Woody Allen. Despite receiving early praise in a profile done by PBS’s Charlie Rose, the Weinstein Company’s decision to push the release date back to spring only indicates that the film, which also stars Kevin Spacey as Today show co-host Billy Bush, may never actually see the light of day. To boot, all plans for an awards-season promotional campaign headed by Bob Weinstein have reportedly been scrapped, meaning the film might not even be released by May 2018—if at all. Yikes. Talk about a perfect storm of bad timing. 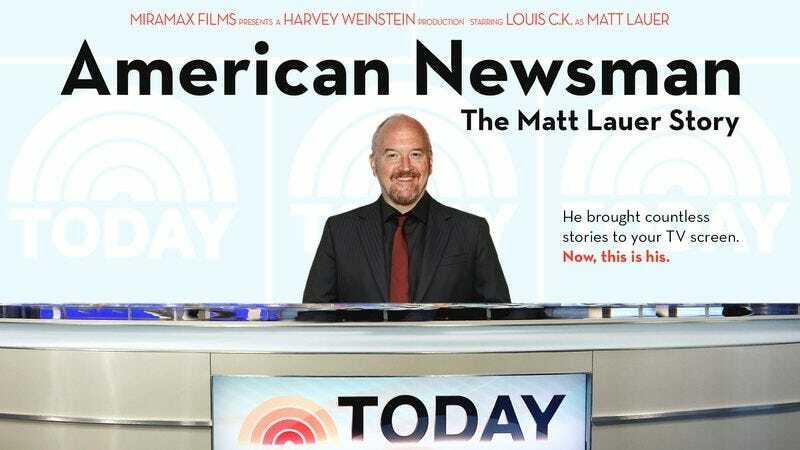 Plus, with several of the movie’s supporting actors such as Jeffrey Tambor, Jeremy Piven, and Richard Dreyfuss already distancing themselves from the project since Lauer’s firing, this Matt Lauer biopic truly appears to be on life support. So is this film in trouble? Well, it’s pretty obvious that the head honchos at Miramax cannot be happy right now. But who knows, in a couple of months, the movie could be released to rave reviews—only time will tell!